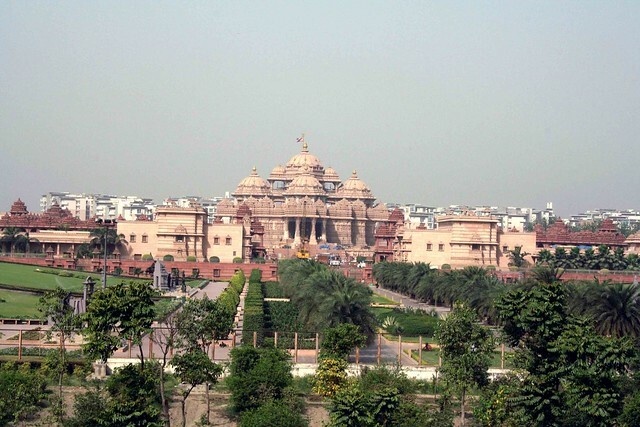 According to The New York Times, Swaminarayan Akshardham Temple has a “Disney touch”. That’s very insulting but that’s no exaggeration. 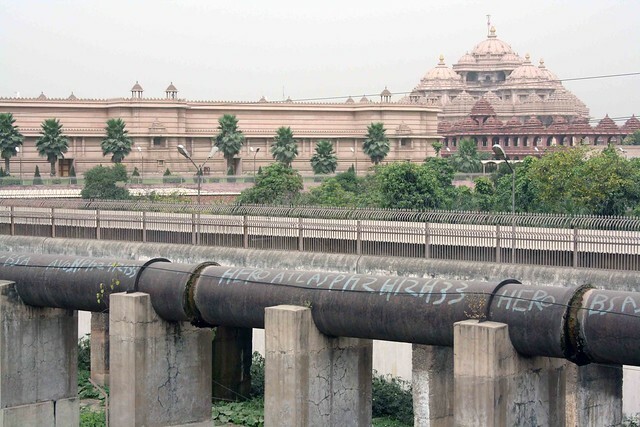 Akshardham has a musical fountain, a large format movie screen, and also boat rides, all coming with a fee. Offering a mix of religious and nationalist paraphernalia, it has statues of sadhus as well as of “patriots of India”. Built over 100 acres on the banks of Yamuna by a sect called Bochasanwasi Shri Akshar Purushottam Swaminarayan Sanstha, the temple is dedicated to a 18th century Hindu godman called Bhagwan Swaminarayan, who at age 11 embarked on a spiritual journey across the subcontinent. 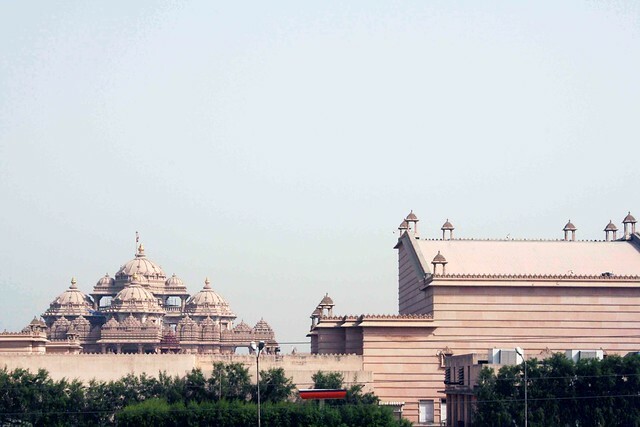 The Swaminarayan temple complex is a strange mix of architecture styles, ranging from Deccan to Mughal to Mewari. The intricately carved marble interiors are reminiscent of opulent Mughal tombs and palaces, the main building’s red sandstone facade seems to pay ode to Deccan style temples (most prominently Meenakshi temple in its ostentatious carving), while the boundary wall and supporting structure seem to be inspired by a mixture of Mewari and Mughal styles. Don’t expect much spiritual contemplation here. There is a constant crowd of people streaming through. But if you don’t tire easily, the place could engage you. 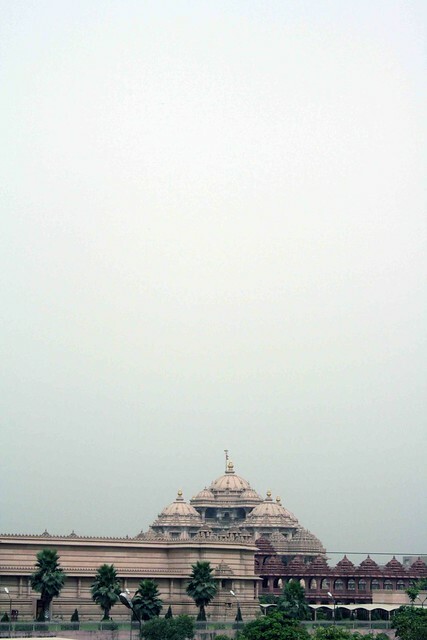 The temple, the complex’s chief attraction built of pink stone and white marble, is all about numbers. It has nine domes, 20 pinnacles, 234 pillars and over 20,000 sculptured figures. 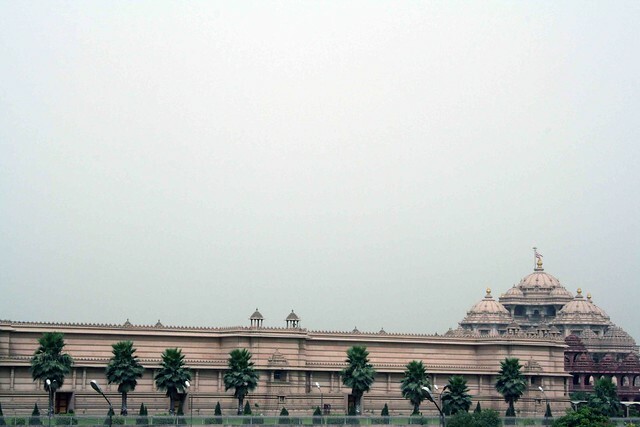 In the center is the gold-plated statue of Swaminarayan. The structure stands on a plinth that is sculptured with 148 elephants. The surrounding two-tier colonnade has over 2,000 pillars and 300 windows. There is also a food court and souvenir shop. Visit this temple to get a hint of tomorrow’s heritage. All religious places, corrupt the mind with superstition and myths, dull the intellectual quests by demanding to not question their religious norms, and are sheer waste of money that could be spent on education, health care and the betterment of the humanity.